2015 has been a great year for us company-wide, for the first time in company history we have crossed the 1,000 transaction threshold, and currently, with just a few weeks left in the year, we are over $130 million dollars in sales volume: another record year for ERA Team VP Real Estate. We are approximately 8% ahead of last year and we’ve got great plans for 2016. We have our two newest offices that have been a part of our company, completing their first full year this year: Yorkshire and Bradford. I would like to acknowledge our two branch leaders in Yorkshire and Bradford, Rita White and Denise Whipp for doing a remarkable job integrating those two locations into the ERA Team VP family and also for exceeding our expectations and projections for those two offices in just their first year. We also have a new office location in our Cuba, NY market. We moved from a nice location right off the expressway into downtown Cuba, which is a vibrant and growing community with lots of great new commercial businesses opening. We have been very well received by the community in Cuba with our new location. Another big initiative that we have started, and have almost completed for this year, is our strategic planning process for 2016. We went to great efforts to get feedback from our agents and support team and that feedback was phenomenal, giving us great direction for 2016. We are very focused as a management team, working on our top 4 initiatives, and look forward to rolling those out at our awards banquet in early January of 2016. As we are about to wrap up the year, here in western New York we’ve have a very warm and snow-less December, but we did get some great snow in our Ellicottville market, our agents and team in Ellicottville are very excited to kick off the holidays! I’d like to wish all of our team a very Merry Christmas, a great holiday season and we’ll look forward to speaking with you again in early January! 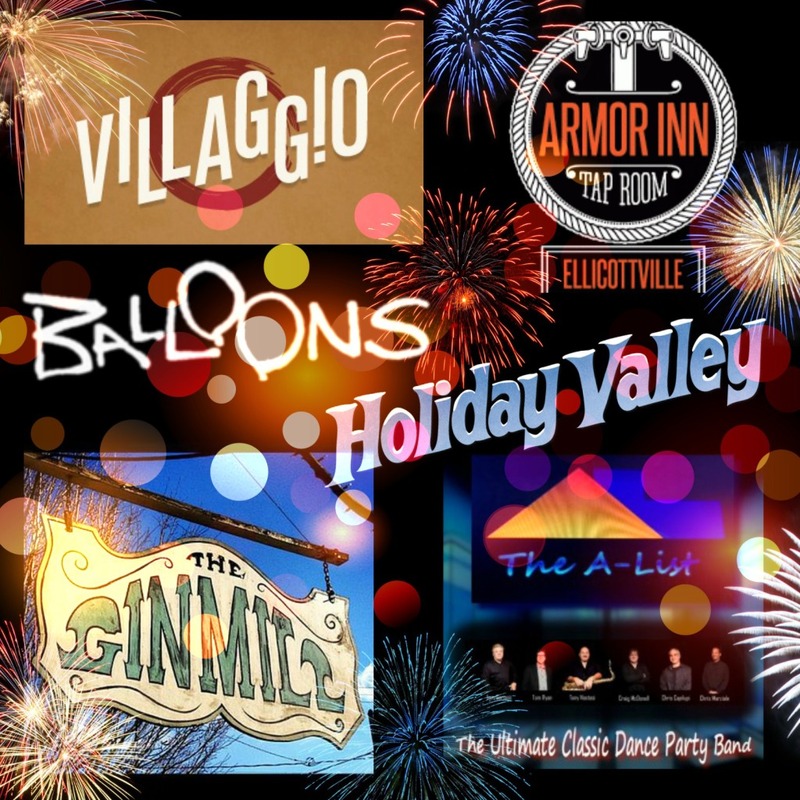 Kicking off the New Year in Ellicottville, NY? Here is the recipe to a perfect New Year’s Eve… packed with music, food, and fun! Start off your night by indulging on one of the many choices featured on Villaggio’s Special 2015 New Year’s Eve Menu. With entrees ranging from Lobster Mac & Cheese to Veal Chop & Artichokes, there’s sure to be something to satisfy your tastebuds! Click here to view all of the decadent options that are being offered. If you are planning on indulging at Villaggio this New Year’s Eve, make sure pick up a gift card beforehand and earn $15 in Villaggio Cash back for every $100 you spend! Next, take a short walk down the street at 7:00pm for some live entertainment, courtesy of the A-List Band. Comprised of 6 seasoned musicians, the A-List Band performs a wide variety of music from Rock to Funk. Find your place on one of the two dance floors and be immersed by the lights and music from the incredible world class sound system and light show! Be sure to make your way over to the bar for a $3 drink special from 6pm-9pm. Still in the mood for music? The Gin Mill is featuring the 3 Easy Pieces at 9pm! This family-owned and operated tavern has been open since 1976 and offers pub grub & draft beers! Be sure to stop by, as they have a huge selection of beer on tap! Looking for a more family-friendly event? Holiday Valley will be hosting their annual New Year’s Eve party. Beginning at 9pm with music and DJ entertainment in the Holiday Valley Lodge, the event includes drinks, food specials and mocktails for the kids as well as party hats, glowsticks, and noisemakers. Cindy’s Chairlift remains open for an extra hour and followed by a Grooming Machine parade at 11:15pm, a torchlight parade at 11:30, and concluding with a “knock-your-socks-off” fireworks show beginning at 11:45! Entrance to the New Year’s party is free and reservations are not required. Cap the night off with a champagne toast at midnight at the Armor Inn! Reservations are recommended for this event so make sure to give them a call at 716-699-1143. They will be offering their regular menu as well as a special New Year’s Eve Menu. After celebrating the New Year in Ellicottville NY, skip the drive home and book a stay in a Vacation Rental Home! ERA Team VP Vacation Rentals located at 12 Washington Street, has accommodations available in the Village, near Holiday Valley and HoliMont, and in the surrounding countryside. Call our office 716-699-4800 to speak with a seasoned reservationist and finish your New Year’s Eve celebration in the comfort and convenience of a local Vacation Rental Home! Posted on December 18, 2015 Author ERA Team VPCategories EllicottvilleLeave a comment on Kicking off the New Year in Ellicottville, NY? Here is the recipe to a perfect New Year’s Eve… packed with music, food, and fun! The 911 Toy Express is making sure that many families wake up to a Merry Christmas morning! Hosted by the Bradford City Police and Fire Department, the second annual 911 Toy Express brings Christmas gifts to students in the Bradford Area School District who have been identified as someone in need. 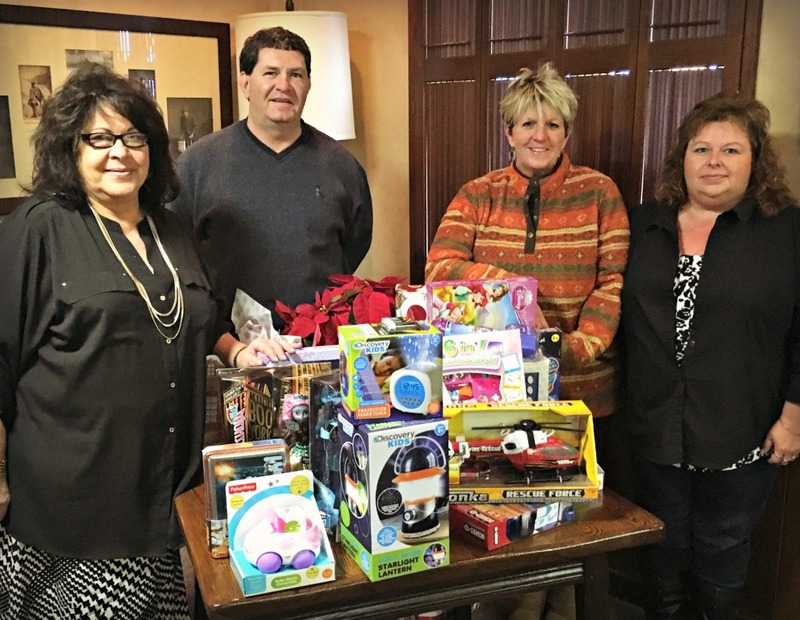 The McKean County Association of Realtors took part this year, donating toys to the 911 Toy Express and also a cash donation was presented to the Kane and Smethport Food Pantries. Mary Brzenski, board president, Kathleen Obermyer, board member and Vera Miller, program chairman, all ERA Team VP Real Estate agents from the Bradford PA office, spearheaded the drive. The Board of Realtors followed up the donation drop off with their Christmas luncheon, celebrated at the Bradford Club. If you are interested in making a donation to this year’s 911 Toy Express, unwrapped toys or gift cards for children between the ages of 2 and 18 will be accepted at the Bradford police and fire stations and will be delivered on Christmas Eve. Last year’s drive delivered toys to between 20 and 30 families. Prefer to admire the picturesque snow covered landscapes in Ellicottville from behind a window? Check out these 5 INDOOR Activities to enjoy from the warmth of indoors this winter! Come for one game or sign up for a league! EVL Bowling offers a state-of-the-art, family friendly facility, with a full arcade, prizes and big screen TV’s galore! The lanes are open Sunday-Thursday 11am to 10pm and Friday-Saturday 11am to 11pm. If you’d like to join a current league, or are looking to make one with your family and friends, give them a call at 716-592-9001. Short leagues are also available. Warm up your winter with one of Tim & Bonnie’s gourmet pizzas while you bowl! 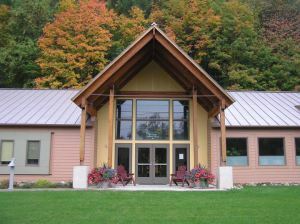 Keep an eye on the Ellicottville Memorial Library’s Facebook page for upcoming Family Movie Nights displayed on their brand new 70” TV screen in the Community Room of the Library! This Friday, December 11th at 6:30pm is a showing of “The Muppet Christmas Carol”. Bring the kids for a family-friendly evening where admission, popcorn and a drink are all free! Artist, Rebecca Szpaicher, will lead you in drawing a simple painting with the luxury of not only paint but wine as well!! 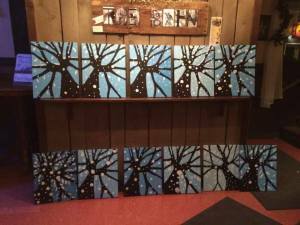 Each session is held at a different venue throughout Cattaraugus County, so make sure to check their Facebook page for the schedule of events and to find out which painting will be created that night. Although originally an “adult’s only” experience, Canvas and Cocktails are now offering children’s paint classes for ages 5 and up (wine is not offered!). Ages 5-11 will need to be accompanied by parents. All participants for any event must preregister either by calling (716) 560-7489 or emailing cocktailsncanvasny@gmail.com. Come sit back, relax, and enjoy yourself! Explore behind-the-scenes of The Ellicottville Brewing Company this winter! EBC is a select micro-brewery of craft beers and also serves a wide array of savory and satisfying American cuisines. Make sure to schedule a personalized tour of the brewing operations and warm up from the cool winter winds with your very own custom beer sampling session! Each tour includes a take home commemorative EBC glass so you can reminisce the experience when you are home drinking one of EBC’s signature craft beers, including their recently released “Hang Time” Pale Lager, brewed to benefit the P.U.N.T Foundation: a WNY charity founded by legendary Buffalo Bills punter Brian Moorman. Brewery Tours begin at 2pm and 4pm on Fridays, and Noon, 2pm, and 4pm on Saturdays & Sundays. 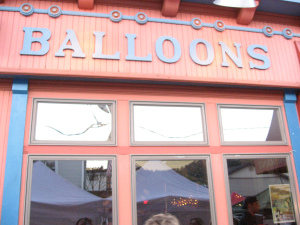 Established in 1990, Balloons is Ellicottville’s ONLY Nightclub! Different bands are highlighted every Friday and Saturday night, with upcoming headliners including The Rhythm Rockers, Tommy Z, Impact, Strangers, and the DeJa Groove Band. Escape the winter chills by finding a spot in front of the live music stage or on one of the two dance floors and enjoy the incredible world class sound system and light show. If the nightclub atmosphere is not for you, then find your way to the back bar for a quieter, more relaxed, family friendly atmosphere where you can enjoy a cocktail or order from their delicious dinner menu. Give us a call at to speak with a seasoned reservationist about booking your own private vacation home rental so that you can fully experience all of the winter activities that Ellicottville has to offer! Jane Grice, local real estate agent with ERA Team VP Real Estate was recently named the 2015 REALTOR of the Year by the Chautauqua Cattaraugus Board of Realtors. Grice was honored at the 94th Annual Installation of Officer Dinner held at The Shorewood Country Club in Dunkirk, NY in November. The REALTOR of the Year award is a peer nomination based on the following criteria: involvement in the real estate industry at the local, state and national levels, civic activity, business accomplishments, and conduct and service to clients. “The Realtor of the Year Award is a very well-deserved honor for Jane, and all of us at ERA are thrilled that she has received this recognition” said Bill Soffel, Broker/Owner of ERA Team VP Real Estate & Vacation Rentals. “Jane is the consummate professional, always going above and beyond to provide the very best in customer service to her clients and customers. She has also demonstrated a real commitment to supporting the Chautauqua County Board of Realtors, and to giving back to our community. I am very proud to be associated with Jane”. 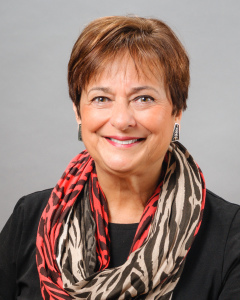 Grice has been actively serving the Chautauqua Cattaraugus Board of Realtors since she joined in 1986. She has spent 7 years on the Professional Standards Committee, 6 years as the Chair of the Equal Opportunity Committee, and 4 years on the Membership and RPAC Committees. She has also served as a Director of the Board of Realtors for 8 years. Grice has held the position of Vice President, Secretary, and President – leading the board through the complicated task of merging the Chautauqua and Cattaraugus boards. In addition to her dedication to the Board, Grice has 31 years of Real Estate experience, and has been a Multi-Million Dollar Producer for 29 years, a Platinum Award Winner for 9 years, and Gold Award Winner for 11 years. Grice grew up in Painesville, Ohio, before moving to the Chautauqua Lake Area in 1972. Her husband, Jerry Grice, is a custom homebuilder and her son, Luke, is a graduate of Miami of Ohio. Jane is active in the community, serving as an Auxiliary Member for the Chautauqua Volunteer Fire Department for 14 years, is presently the Secretary, and has served as the Past Commissioner. She is also a Children’s Advocacy member for Chautauqua County. For more information about ERA Team VP Real Estate and the real estate market in Western New York visit ERATeamVP.com, contact our Chautauqua office at (716) 789-2600, or call Jane Grice directly at (716) 499-9552.